ISR is representing NJ Transit in discussions with the Long Island Rail Road, Metro North, Amtrak, and SEPTA on Spectrum interoperability issues? 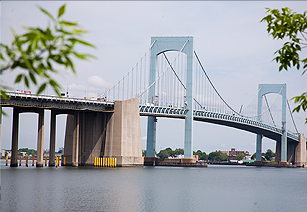 ISR is the Resident Engineer for this upgrade to the security system on the Throgs Neck Bridge. Originally part of the overarching Integrated Electronic Security System C3 program, this vital NY crossing has been made a stand alone project. The project is to Furnish & Install an upgraded and compatible Electronic Security System including CCTV, Access Control and Intrusion Alarms. Additionally the project will provide new fiber communications, new centralized UPS and low voltage power as well as expand existing data storage room and upgrade auxiliary HVAC. ISR will provide lead inspection/oversight of the system integration as well as provide test acceptance coordination and training.